I've been meaning to try Arctic Fox's hair dyes for a couple of years but never got around to it because I feared it wouldn't show up on dark hair. It's been coming up more and more on Instagram again so I did some research and apparently Purple Rain, Aquamarine and Poseidon do show up on dark hair. So that's what I purchased! These retail for $7.99 (4 fl oz) or $13.99 (8 fl oz) on the Arctic Fox website but I got mine off Amazon. Arctic Fox hair dyes are vegan and cruelty free. They also do not contain harsh chemicals like peroxides, ammonia and PPD. These are semi-permanent and they contain conditioning agents which means you can use these dyes as often as you want to without damaging your hair. Semi-permanent hair dyes only coat your hair so it will fade with each wash. The bottle claims that it can last up to 40 washes. These smell like grape candy so it is such a treat to use them. The instructions to use this is pretty simple. 1. Shampoo and wash hair without conditioner. Wait for hair to dry. 2. Put on gloves/vaseline to protect skin from staining. These are really pigmented so you might want to lay some papers on your bathroom counter too. 3. Apply dye and let it sit for >30 minutes. You can put it up in a plastic cap and blow dry/process with heat for up to 15 minutes to lock in the color. 4. Wash off with cold water. I have naturally dark brown hair but I had previously dyed my bottom half with the L'oreal Colorista Paint hair dye in Violet so it is considered "processed" since that dye involved developer. When I tested the AF hair dye, I did put it on the virgin parts and processed part of my hair. I wanted to try all 3 colors at once so I dyed sections of my hair in different colors. It didn't exactly turn out as I was expecting but I still got the job done. This is Purple Rain and it turned out really nice on my hair. I really like this shade of purple because it has a warm pink undertone to it as opposed to a warm red undertone like most violet dyes do. This color bled when I used shampoo but stayed on well when I just rinsed with water. After 7-8 washes, it faded to a pinky red. It definitely wasn't as vivid as when I first put it on but it did stain my hair. Aquamarine turned my hair green although it looks like a nice teal in the picture. This color bleeds whenever it comes in contact with water. It stayed vivid for about 2 washes but after 4-5 washes, it was totally gone. I can't really find Poseidon because I'm thinking I didn't put enough to fully saturate my hair or the color neutralized my previous hair color. 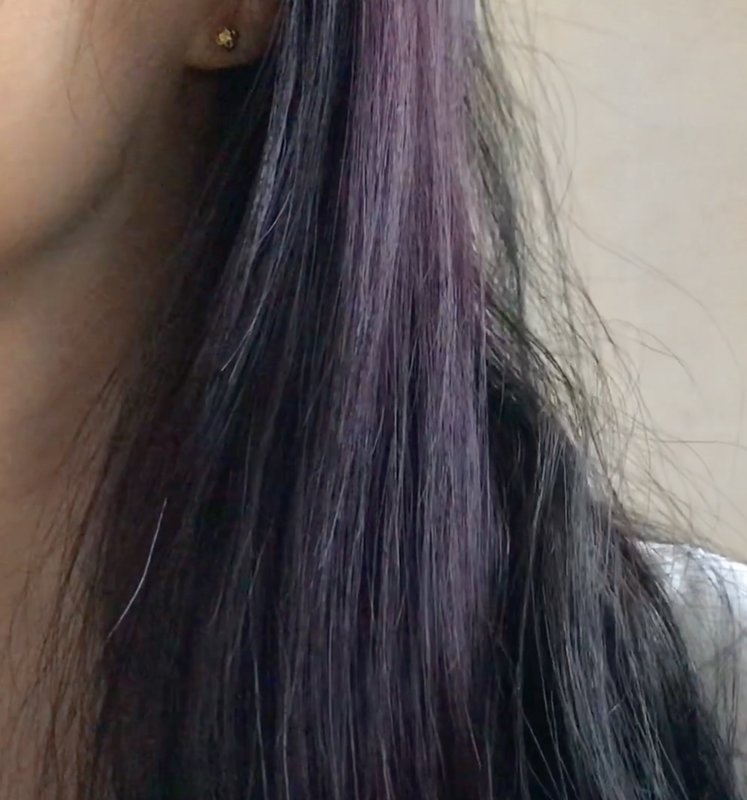 In person, I can sort of see it on my hair ends but I couldn't really capture it in picture or video. All in all, I think if you want to ensure that the colors show up in a vivid and even manner, I would recommend putting 2 layers because I noticed that the sections with 2 layers are so much more vibrant and lasted a couple of days longer. Unfortunately, it doesn't last very well on virgin/untreated hair so I will be continue processing my hair a bit with the Loreal Colorista before using Arctic Fox so that the color sticks better. You can also mix it in with your shampoos/conditioners to give it a touch up every time you wash your hair. But I get it, it is high maintenance. It will probably last a lot longer and stain better if you have lighter hair.